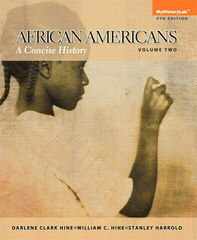 African Americans 5 Edition A compelling story of agency, survival, struggle and triumph over adversity African Americans: A Concise History illuminates the central place of African-Americans in U.S. history by telling the story of what it has meant to be black in America and how African-American history is inseparably woven into the greater context of American history. It follows the long and turbulent journey of African-Americans, the rich culture they have nurtured throughout their history and the quest for freedom through which African-Americans have sought to counter oppression and racism. MyHistoryLab is an integral part of the Hine / Hine / Harrold program. Key learning applications include Closer Looks, MyHistoryLibrary, and writing assessment. A better teaching and learning experience This program will provide a better teaching and learning experience—for you and your students. Here’s how: Personalize Learning - MyHistoryLab is an online homework, tutorial, and assessment program. It helps students prepare for class and instructor gauge individual and class performance. Improve Critical Thinking - Focus Questions and end-of-chapter Review Questions help students think critically about the chapter content. Engage Students - Voices boxes engage students in the works and words of African Americans. Support Instructors - A full set of supplements, including MyHistory, provides instructors with all the resources and support they need. Note: MyHistoryLab does not come automatically packaged with this text.